A three-day international workshop on defining transboundary conservation principles determined some of the most essential topics to be elaborated in the upcoming edition of Best Practice Protected Area Guideline Series. 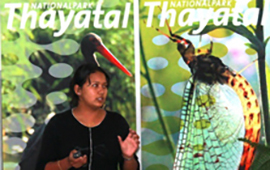 The workshop was held in Thayatal National Park, Austria, from 16 to 18 October 2013 within the framework of the project titled ‘Revision of the IUCN WCPA Best Practice Guideline on Transboundary Conservation’. About 24 transboundary experts and protected area managers from 16 countries attended the event. The International Centre for Integrated Mountain Development (ICIMOD) was represented by Research Associate Ms Sunita Chaudhary of Ecosystem Services. 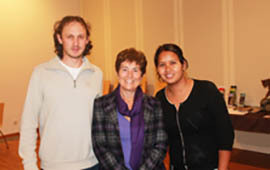 She made a presentation on transboundary conservation and development initiatives in the Hindu Kush Himalayan region. The presentation was highly appreciated by global experts and ICIMOD was perceived as a key organisation for initiating transbounadry cooperation in the region. Ms Sunita Chaudhary also contributed in determining the overall content as well as in defining key terms for the Best Practice Guideline. On behalf of ICIMOD, Ms Sunita Chaudhary in consultation with the IUCN Focal Person of ICIMOD, committed to contribute to relevant chapters as well as write case studies for the Best Practice Guideline. The Guideline is one of the most popular publication series produced by IUCN WCPA and followed by policymakers, practitioners, academics, researchers, conservationists, and protected area manages worldwide. The Guideline will be launched at the World Park Congress, to be held from 12 to 19 November 2014, in Sydney, Australia. Ms Sunita Chaudhary also networked with global experts on transboundary conservation for future collaboration on relevant themes for transboundary landscape initiatives at ICIMOD. In particular, a strong relationship with IUCN WCPA Transboundary Specialist was strengthened and ICIMOD has been asked to partner with IUCN WCPA for launching the Guideline in 2014.